The Single Tread Step is Molded in durable U.V. resistant Polyethylene. Taylor Made Products own StepSafe™ non-slip pad is adhered on the top of each step, for additional slip protection while boarding. 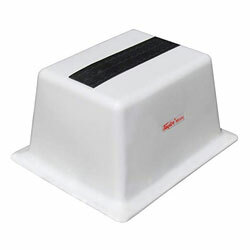 StepSafe™ Dock Steps can be screwed down to the dock, if desired, through the mounting holes on the base flange. They are also lightweight for easy movement in yards or marinas where a permanent solution is not available, such as, on gravel. Maximum weight up to 300 lbs.